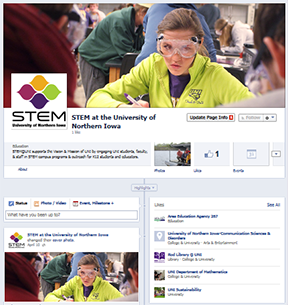 University of Northern Iowa STEM Ambassadors are undergraduate students passionate about their STEM major. Each STEM Ambassador represents one of the UNI STEM departments and the University at state, regional, and on-campus for UNI Students and outreach to K-12 students, educators and the public. Apply to become a STEM Ambassador Today! Or search for department specific scholarships here. O*NET STEM Career Search provides detailed information about hundreds of STEM fields. Green careers and growing careers are easy to identify (green leaf, yellow sun). Learn about the every day tasks, technology and tools used, required knowledge and skills, and much more about each career. O*NET is a great site to begin a career search; each career is linked to related careers and is described in detail. O*NET's data comes from the Bureau of Labor Statistics, U.S. Department of Labor. O*NET career pages often link to CareerOneStop and mySkills myFuture. CareerOneStop goes beyond exploring careers by providing job seeking tools. Career Cornerstone Center includes podcasts and other resources about STEM fields. Learn about and/or sign up for a Start Smart Workshop at UNI.